We’ve seen gear sporting our favorite NHL logo on the big screen, and now it has shown up on the small screen. 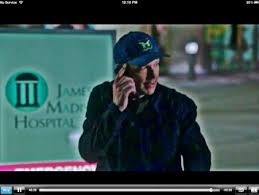 The familiar green, white and blue was seen on a hat worn by a character on the television show, “Scandal.” This aired nearly 16 years to the day, our beloved Hartford Whalers left Connecticut. This screen shot was sent to me by an eagle-eyed Whalers fan in Los Angeles, Mike Long. Mike worked as an associate producer here at WFSB about 20 years ago, when our studios and the home of the Whale were separated by only a few blocks. Various reports have Whalers paraphernalia among the best selling of NHL teams past and present. The melded H and W have been spotted being worn by Megan Fox, Adam Sandler, Jason Bay, Brian Cashman and the list goes on. Read about all of that in these links below.